Givenchy’s Japanese Ode to Ohno. One cannot doubt the mastery and vision of Ricardo Tisci at Givenchy and his purity of influence. One can, however, query if this couture collection is aimed at a truly Givenchy customer or if Tisci is merely wishing for the woman (Daphne Guinness?) 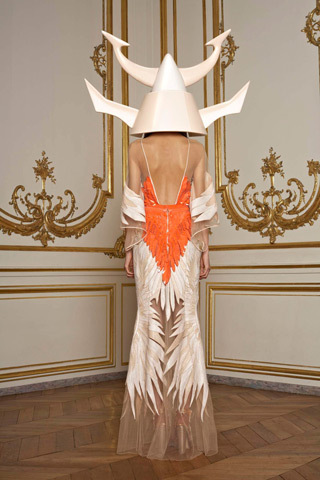 who would wear such Asian influenced, idiosyncratic couture art works. Structure was the key word as real life kimono ballerina, couture ‘robot’ chess pieces strode forth, part Geisha, part Origami artwork, in gowns that seemed to wear the wearer. This was defiantly ‘look but don’t touch’ couture. Tisci, influenced by dancer Kazuo Ohno’s highly stylised and ritualised Botoh performance concentrated on restrained, razor sharp Eastern beauty. Laser cut columns were finely detailed – beaded, embroidered or feathered. All were floor skimming and severe in their beauty, in the finest cream silk or tulle and sheer chiffon. Flashes of fluorescent orange, fuchsia or lime green acted as the catalyst to such blindingly beautiful and delicately sharp austerity. 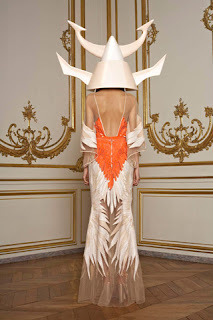 Philip Treacy was the choice for the futuristic crane style head pieces that helped merge modern Geisha with Harimuka doll. 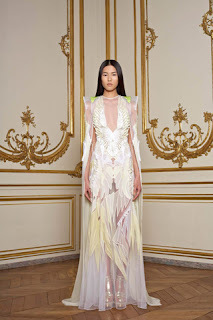 Please let me know what you think of Givenchy’s latest couture show in the comment box below.